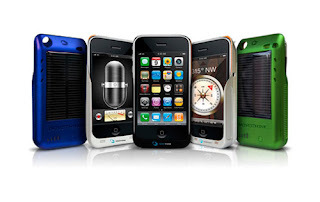 If you'd like to explore a new way to charge your iPhone or iPod touch when you're outdoors, then consider the Novothink Solar Surge iPhone /iPod touch charging case. NOVOTHINK empowers you to take advantage of the free, clean power of the sun by offering innovative solar technology for today’s portable electronic devices. Everyone can make a positive difference for our planet and you will be cearly knowing that through small steps, you are doing your part in helping combat global warming. Power up while walking, running, hiking, on the beach, camping, or traveling anywhere.It should give you between four and eight hours of talk time, or up to 20 hours of additional audio playback when the charger is fully charged, but the company says you can still expect to get between 30 and 60 minutes of talk time after two hours of exposure to direct sunlight. Package includes: Solar Surge Charger, USB mini-cable, Operating Manual, Novocord. It will cost you $79.95 for the iPhone 3G/3GS version and $69.95 for the iPod touch version (second gen only).